Jordan Brand is set to celebrate the 20th Anniversary of the Air Jordan 14 Last Shot in 2018. For the occasion, you can expect special added details to this iconic moment in Michael Jordan’s career displayed throughout the shoe. Originally debuted during the second half of Game 5 of the NBA Finals, while MJ wore them during the entire Game 6 vs the Utah Jazz. We recently saw Jordan Brand celebrate the Air Jordan 14 with the Finals Pack earlier this year, but this release will be more focused on the actual pair MJ wore. Look for the Air Jordan 14 “Last Shot” to release on June 14th during the NBA Finals at select Jordan Brand retailers. The retail price tag is set at $190 USD. UPDATE: Jordan Brand is officially set to release the “Last Shot” Air Jordan 14 tomorrow, June 14th. They’ll be available via Nike SNKRS at 10AM ET. UPDATE: Detailed photos of the “Last Shot” Air Jordan 14 Retro via GC911. UPDATE: New photos of the “Last Shot” Air Jordan 14 2018 Retro for its 20th Anniversary. Photos via weocia. 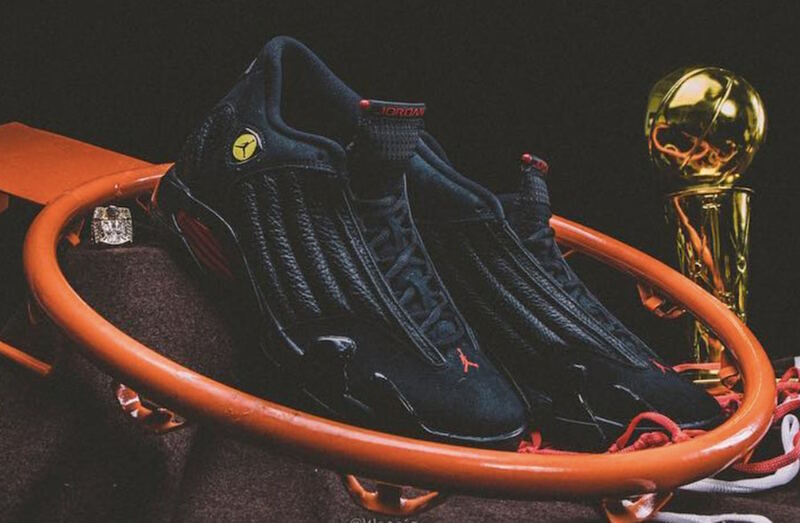 UPDATE: Detailed look at the “Last Shot” Air Jordan 14. UPDATE: Jordan Brand is bringing back the Air Jordan 14 “Last Shot” as part of their Nike Champions Think 16 Collection. Its release is a nod to Michael Jordan’s infamous 20-foot jumper, which sealed him his 6th NBA title and 6th Finals MVP.